Double Sided Roll Up Banner Stand-33" Width - Dino Rentos Studios, INC. 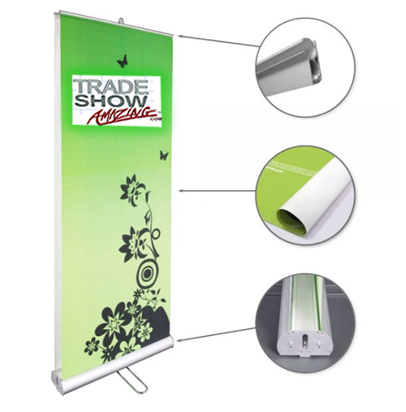 This Double Sided Roll Up Banner Stand is a great addition for any tradeshow display, exposition, or promotional event. • Show banner exhibits (2) 33-1/4"w x 77"h graphics back-to-back for use in a central location. • Custom digitally printed signs are included and pre-installed for immediate use. • Aluminum base, pole and banner rails have a silver finish for promotions at any industry trade show. • Retractable feature and black nylon carrying bag allow presenters to easily transport the unit.